1. Getting ready to board in London, I walked past someone who looked familiar. Looked back and this time I recognized it was Governor Peter Obi of Anambra dressed very casually in jeans and a jacket over a simple shirt. Went to say hello and tried to make small talk before the people in 1st Class were called to board. We got to Lagos and when I got to baggage claim, I saw him pulling off one of his boxes from the conveyor belt. All the while he was waiting for his other bag (I left him there as his second bag didn’t come out in time), he stood there gisting with other passengers and even collecting phone numbers and business cards from seemingly random people. Of course, this is not why we are here. You can ask the French how they are faring after they elected a guy who campaigned as ‘Mr Normal’ last year. But in Nigeria, abnormality is so rampant that the people who act ‘normally’ end up looking like the crazy ones. Well done to the Governor for carrying his own bags. 3. I don’t want to come across as insensitive about this and it’s important to know that 99% of Nigerians won’t share my opinion on this, but I found internet access to be a bigger headache than electricity. Every morning, I try to do a newspaper review through my twitter handle. The idea is to pick out like 10 (mainly business) stories and tweet the links with a short smarty pants comment. It’s rather amusing that I couldn’t do this review of Nigerian newspapers because I was in Nigeria. I was on the receiving end of some incredibly useless service from MTN. It’s one thing to see Nigerians complain about poor service from the company but to actually experience it was painful. For example, when I was last in Nigeria in August 2012, I spent 3 days so I just set up my email on my blackberry using the BISWEEK plan (one week blackberry internet service). Worked without any problems and I was at least able to use emails very well. So this time around I did the same BISWEEK plan and set up my email as usual. The emails started coming in as expected. But I then tried to reply an email and got a message saying I couldn’t do this because ‘my plan wasn’t set up to reply to emails’. What kind of monumental idiot comes up with stuff like this? It’s not enough that you charge me for 1 week access, you want me to either pay or jump through another hoop for the privilege of being able to reply to the emails you allow me receive? Things are hard in Nigeria and people will do well to heed the maxim – First, do no harm. Because it seems that where things are already difficult and stressful to use, some sadists relentlessly come up with ways to make them even harder. MTN did not also bother to tell me how exactly to go about entering into this privileged place where I would be able to reply to my emails. So I was restricted to responding to emails by going via the web. I do not have the words to describe how painful this was. I saw so many different error messages driven by internet access on my phone…I didn’t even know such messages exist. How about holding a conversation with someone? I was in traffic trying to firm up details with someone for a meeting. To make sure we coordinated time and location, we were chatting on BBM and WhatsApp at the same time. Once I send a message via BBM and it ‘hangs’, I switch to WhatsApp until that one also seized up and then I switched back to BBM. Ad infinitum. World without end. Etcetera etcetera. 4. The experience at the ‘International’ airport also follows the policy of making life as hard as possible for Nigerians. By the time I was being ‘checked’ for the 5th or 6th time just before boarding the plane, I lost my rag and gave the hapless guys rifling through my hand luggage and pledging their ‘loyalty’ a handful. What exactly is the thing they are looking for? You frisk me thrice and check my bag endlessly. You collect my passport 3 different times and take the details in it. You rifle through my bag while looking at me and asking me to do weekend for you. It really is a frustrating experience especially because the airport is quite small so the efficient thing to do is to get people in and out of the place as quickly as possible. And this time around, I observed how begging has become such a massive industry in Nigeria. The professional beggers at the wedding in Ibadan were particularly impressive. A friend came to see me there and as I was walking her to her car, they began to hail her and mentioned a name I didn’t recognize. She then told me that the name they mentioned was that of her friend with whom she had attended a burial party 2 days before. Just in case she had forgotten, they seemed to be reminding her. A bit scary on some levels. 5. Almost a month ago now, my twitter feed was taken over by lots of my friends mourning the news of Efere Ozako’s death. Shamefully, I had never even heard of his name before that day but it soon became one of those situations where every one of your friends knew the guy except you. Not a single person I knew had an unkind word to say about him and the feeling of loss among those who knew him seemed genuine. He was apparently a larger than life lawyer in Nigeria’s entertainment scene. I got to Lagos and was speaking to my young lawyer cousin and it turns out she used to work for Efere Ozako’s firm. Now, I hesitate to pass any kind of judgement on someone who I never even knew but this is the point I want to make – immediately after he died, all the 8 lawyers and 5 support staff in his firm were asked to leave. Basically, the business shut down immediately and that’s that about it really. He was a young guy and was running about 3 businesses at the same time; it is possible the stress contributed to his death. Again, this is me speculating and I stress that I am not trying to be insensitive. I listened to my cousin shake her head ruefully at the many dreams that the guy had and how they may have all died with him. My dearest Nigerian entrepreneurs trying to make an honest living in a country that shows you no love; you know I love y’all from the bottom of my heart. I know the hustle is incredibly real too. But you have to remain alive for any of it to make any sense in the long run. I remember interviewing Ndidi Nwuneli of LEAP at TEDxEuston last December and she could hardly complete 2 sentences without dropping the words ‘succession planning’. She’s big on it and she told me with pride how she no longer runs LEAP because she’s been able to find people and processes that make it possible for her to focus her energies elsewhere. I had a chat with a businessman who runs 5 businesses. I know he’s had a particular Indian guy working for him for about 6 years in his first company. When he told me how much he pays the guy (millions per month) my jaw fell on the floor. It sounded like oil and gas money and yet this businessman was willing to pay such sums. He told me that, paying that money is what allows him to be able to run 5 different businesses with a laptop from his living room. He has not had cause to visit that particular office in about 5 years and he has now made this particular guy a part owner in the business. The issue of death remains a ‘God forbid’ topic in Nigeria but if you run a business and have people relying on you for their livelihood, it’s time to turn your work into an institution. 6. I landed in Lagos and almost immediately headed over to Channels Television Station to spar with Ebuka Obi-Uchendu on Rubbin’ Minds. Never done live TV before so I was racked with nerves as soon as I stepped inside the studio. But good fun it was. The TV station is now somewhere off the Lagos – Ibadan expressway and I couldn’t help wondering – how do they get people to come here for SunriseDaily which starts at 7am? The good people at Africa Practice also invited me to speak at a one day seminar for bloggers and aspiring bloggers. I hope the people I spoke to found it useful but it was one of the most enjoyable things I’ve done with an hour lately. I would have shared my slides but they won’t make sense as I merely used them as a guide. Props to the guys who work there; they came across as a really smart, knowledgeable and fun bunch. It’s hard to calculate the damage the epileptic power situation is doing to small businesses in Nigeria but the above, narrated by a friend of mine, is an illustration of the kind of choices people have to make. The barbing salon will lose business from people who simply drive past thinking they are shut but the owner has surely tried the other method of leaving the lights on before and probably worked out the cost exceeds the extra custom he might get. It’s a very harsh environment in which to do business. 8. This harsh environment is perhaps what causes the staff at Iya Pelumi (besides Sheraton Four Points Hotel in Lekki) and Iya Eba (Beckley Street in Lagos) to go out of their way to be rude to their customers. Halfway through fulfilling my order at Iya Pelumi (5 Ogufes and 5 Ponmos), the girl got upset and simply stopped selling. The queue was long and the place was blazing hot. Pragmatism took over and I resorted to massaging the girl’s ego so she could serve me and let me out of there. Over at Iya Eba, a friend joined me briefly and simply had a bottle of malt to drink. Some water spilled on the table in front of him so he reached for the serviette to wipe it. The lady considered this to be a mortal sin and loudly made him know that merely drinking a bottle of malt did not entitle him to serviette usage – ahn ahn Broda, e jeun rara e de fe ma ko serviette? Of course when we were leaving she smiled and wondered how we dared to ask for our change. We obliged and let her keep it. And all was well with the world again. Oh, at Iya Pelumi I also tipped the girl after she calmed down and completed my order (I only got 2 ponmos because while she was dithering, someone else had sold all the ponmo to another waiting customer). It is possible that bad customer service is part of the ‘experience’ being sold in these places. I have also wondered how a single lady might break into the bukateria business. You clearly have to be Iya Something to be taken seriously (Technically, Iya Aje is childless but the word on the streets is that she killed her children and used them for whatever it is that makes her food to sell so well). We might need legislation to smash the ‘married with children’ cabal controlling this sector of our economy. In unrelated news, I am told that a group of Americans have conducted a price discrimination experiment on how rents are determined in Lagos. As a result they have been able to work out the premium that wearing a suit to go and view a property will add to the rent you are quoted. I am told that the results they found were uncanny to say the least. Once it is made public, I will share it if I have it. Being a leper is not a small ‘but’ and it qualifies everything else no matter how exceptional. This is the story of rental properties in Lagos. Because quality is generally not very good, when you find something that manages to pass the smell test, you pay with blood and tears for such comforts. Everyone I visited or know, had one major ‘but’ about their property. But they deal with it. I visited a friend who lives in a really nice and spacious flat on the Mainland. Alas when he showed me into the bedroom area, I thought I was falling down until he laughed and explained that the flat was bizarrely sloping down one way. I mean, this was a nicely looked after property and the landlord seemed to be a reasonable sort judging by what he told me….but it was sloping. You don’t have that many choices. When you see something you can work with, you pay for it quickly through the nose, buts and all. 10. Approaching my Uncle’s house in Okota, we got to his street off Ago Palace Way and saw 3 ‘rivers’ ahead of us. It had rained you see and we weren’t in a 4WD. It would have been tricky navigating those rivers even if we had a small canoe so I rang him to ask what the deal was. ‘E ma wo inu omi yen o…mi o le predict bo se jin to’ (don’t brave the rivers as I can’t confidently tell you how deep the water is) was his response. So we turned around and went through another less flooded road. It was great to see my Uncle looking rather well. But my suspicion is that the way he has achieved better health is by taking life extremely easy and not trying to ‘chase’ anything. Getting out of the area took us a full hour just sitting in one spot of the road that was so bad because some residents took LASG to court to stop them from fixing the road which was going to destroy their (illegally) built homes. In Lagos, you pick your battles. Go out and hustle and risk your health and even life or just stay away from the grind and eat what you kill. Pick your choose. 11. Shoutout to the Molete Massive for making my trip to Ibadan an enjoyable one. I found myself touring Chief Omololu Olunloyo’s library and being awed at the music and movie collection there. From old Hubert Ogunde records to the complete works of Fela on vinyl not forgetting Sunny Ade as well. And there were tons of books and photos as well. There’s work to be done in digitizing all these private collections of history in Nigeria into something more accessible. His engineering thesis, submitted in 1957, the year Goodluck Jonathan was born, was something to behold. In those days, there was no way for typewriters to reproduce scientific equations so they all had to be written by hand. Chief Olunloyo, at a trifling 78 years of age, is himself a force of nature. We began by discussing Framer’s Intent regarding Nigerian constitutions and ended up somewhere in between the local politics of Igueben and Okada in Edo State. No topic was off-limits. He narrated the story of how his family were caught in the 1978 Ali Must Go riots when they were travelling in a CVU – Civilian Vehicle Unit – car. Someone saw the plates and decided to throw a large brick through the back window. The brick hit his then 9 year old son at the back of his head and damaged his spine. He was flown here to the Stoke Mandeville Hospital for treatment. 34 years later, he has remained confined to a wheelchair. I wondered if he felt bitter about this and asked if the person was ever caught. ‘What difference would it have made?’ he responded. Some people were indeed tried but according to him, 40 people died on that same day when it happened so they were fortunate to an extent. Sitting there in the immaculate looking 1945 colonial house he lives in, we were served very fine industrial grade world class garri with cold water and St. Louis cubed sugar. There was also a cooler of asun and another cooler of suya on the stick. Sometimes I cannot believe my luck. The ‘environmental costs’ of repainting the house apparently far exceed whatever benefits might be derived from staying inside a house with a new lick of paint. Be guided. 13. The UI International Cultural Center in Ibadan is apparently less than a year old. It’s as impressive as it is imposing when you enter and it was the venue of the wedding reception I attended. Until you begin to check out the work that has been done and a sinking feeling comes over you. I went to use the bathroom and I was overwhelmed by the shoddy nature of the ‘finishing’ there. I inspected all the toilet doors and not a single one was working as advertised. All brand new and you could tell the tiles on the wall were expensive as they looked really nice. But the whole purpose was defeated by the useless way in which they had been put there. One of the toilet doors could not shut because someone had evidently not bothered to measure the door before installing it in the frame so, yes; the door was bigger than the frame. I took the photo below as a particularly egregious example. Take a deep breath and observe what is going on in the photo above. From the black hole in the wall in the photo, it’s obvious that the plan was to put 4 hand wash basins in the space there. Alas, no measurement was done beforehand so even after using a smaller one (middle) and squeezing it to touch the one left, it would be impossible to fit in a 4th one there. Understand that money has been spent on these fittings that were almost certainly imported. How does someone do this and go back home to sleep at night? Its one thing to complain about poor quality material but the problem in this case is an alarming poverty of labour that cannot even be called skilled. 14. And so it was that on my final night in Lagos, I fell into the company of some terribly bad boys. After hanging out with some friends, I told them I was going home to sleep as I had a flight to catch the next morning. ‘Are you the one going to fly the plane?’ said Winston*. I had no comeback to this but I bravely tried to mutter further protestations. ‘Look, I have gone to catch a flight straight from the club before… 12 hour flight. I landed in America and went straight to the club again’ said Harold* to my horror. ‘Are you afraid that you will miss your flight? We can make sure that plane wont take off until you are on it…we will just tell them not to send the manifest down…come let us show you another part of Lagos’ said Stanley*. I folded. Dear reader, the opportunity to properly ‘research’ this piece was too much to pass up so I went along despite the warning from Edward* who said ‘ah don’t follow these boys around Lagos o’ before they quickly shut him down again. Next thing I know, I am in the VIP section of a club called Sip with a very small crowd of people including Wizkid (his bodyguard is twice his size), Lynxx, Banky W and the delectable Genevieve Nnaji (it was her birthday). I buy music from these guys so you can imagine I was a bit star struck. That report about Nigeria being a big consumer of champagne has to be true judging by what I saw. There were endless bottles of Moet and Hennessy being ‘cancelled’ as they say. I don’t drink, not because I am religious or whatever, but because I really don’t know how to. But I watched in amazement as the bottles kept being replaced for the 2 or 3 hours we were there. This is the life that caused Wizkid himself to ask the rhetorical question in Jaiye Jaiye – owo lo dun to yi? It is hard to describe the frenzy that descends on a party when K Cee’s Limpopo gets played. Everyone goes crazy as if some kind of ‘familiar spirit’ has descended on the place. There were girls, presumably with rubber for bones, covered in sweat and ‘glistening like wet otters’ to borrow a phrase from Boris Johnson the London Mayor, doing dance moves that challenged at least a few laws of physics. Welcome to 1% Lagos. I suppose this is the way that people deal with the madness of the town and continue to function within it. A few days before I also hung out with some friends at Bottles on Victoria Island. It was packed to the rafters. On a Wednesday night with most people obviously still in their work clothes. The crowd drowned out the live band with their own singing. And no, it wasn’t a party…just a regular night out fueled by pitcher after pitcher of frozen strawberry margaritas. ‘Tis many a Lagos….none same as the other. The question of whether or not to move back home will never leave the mind of Nigerians working and living abroad. For some, the decision is made for them when things go bad out here in the West. Others bravely go for no other reason than the pull of blood. But why should you go back at all? It’s most definitely not a better quality of life out there and it can really be a frustrating and overwhelming experience. The answer is greed. This is the only sensible reason why you should go back home. And no, it is not a bad reason at all. You should go because you are greedy and want to do things that are not possible here. It will be incredibly foolish to think you can go back home to ‘change stuff’. You almost certainly can’t. But as Adam Smith pointed out, it is in that intersection of everyone looking out for their own self-interest that value is created. It is that self-interest that ensures that there is no scarcity of meat, beer or bread. Go back home because you are greedy and you want 50% returns instead of inflation + 0.5% that is available here in the West. It will cost you but you can always measure your success or lack of it in a more sober way. If you are not greedy, then stay where you are. Senators and Pensions: What Could Possibly Go Wrong? Bravo bravo feyi.lovely write up.may ur fingers never cease to write or type what u feel. Good work sir. I wouldn’t mind a note on how to effectively manage and make money from one’s blog. Interesting, well documented and good fun! I’m usually dissuaded by lengthy pieces, but your writing is witty and refreshing, I’ll make it a steady staple. Well done! This is lovely, the Nigeria of many facets that I know and love. Not somebodies and nobodies, just people, different types, living, surviving, enjoying life, and catching trips despite it all. FF the younger (and taller), great piece.The class on blogging was also very good. Your garri treat was not complete without milk.Next time, ask for “fine grade” Peak powdered milk and premium groundnuts. Stay away from Cowbell et al.They do not dissolve well in garri – from my experience. The numbering system made what could be considered a lengthy article, easier on the eye. However, I believe there is a small issue with the disclaimer at No.15. Feyi, #13 and #15 stood out to me. Firstly, because I have been thinking about solutions to the dearth of skilled/semi-skilled workers in Nigeria, and secondly because I live in the West. 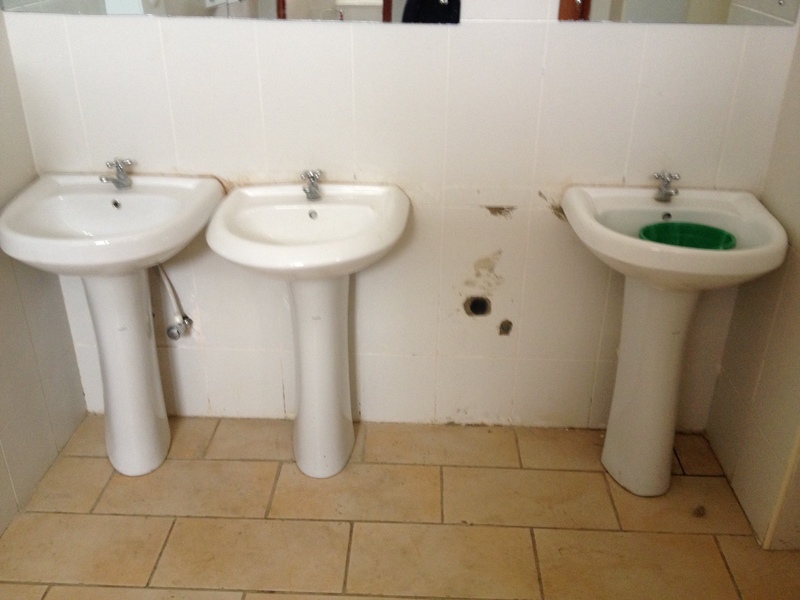 I paused for a few minutes and examined that picture of the wash hand basins closely. I have looked at it at least three more times after I first read this post, hoping a light bulb will trigger a solution to this very SERIOUS problem. Is there really nothing we can do when we encounter such apalling sights? Here, I would usually make my complaints known by writing. I would write to everyone and anyone involved. The building manager, the contractor, management at that level etc. Sometimes, I get some feedback. Writing doesn’t always trigger a response but it satisfies my conscience. Is there a way the contractor could be tracked down and questioned and mandated to redo do the job? I wonder? We might never find out the answersto these questions because we never try. On #15, I quite agree with Adam Smith on the reason for which we are rendered services, but I don’t agree that the sole reason for this is greed. A part of me refuses to accept that the only reason one should try to change the staus quo or make things better is for the sole purpose of greed. I am not discounting the fact that greed plays a role though. Isn’t there something wrong with this sort of conclusion? Is it really impossible to go back and introduce some level of change in some type of way not driven by greed? Now we could discuss what change really means and when one can conveniently say they have made some change. A better approach might be to try searching for people who have returned home and been able to influence some change. Perhaps, we can learn from them and be inspired by them and maybe this might birth a new ideaology with respect to going back home. Feyi, I am sure you will agree with me, that there is a gut feeling on the inside of you that disturbs you at night whenever you return from your trips to Nigeria, or even from the moment you sit back reclined on the plane that keeps you pondering what you could do about your homeland. And if not, maybe you have become cynical like most people already are. I dont pretend to have all the answers to this ‘existential’ question as it were for Nigerians abroad. There are a million and one reasons to move back home…I know people who have made the decision purely to look after their parents in their old age. But you must be motivated to do it and your motivation must not be fickle. The country will test you and challenge even your decency at every step of the way. But the worst scenario is where you move back and run back to the west after a year…this happens a LOT. For me, I think greed will do it for me. The opportunity to go and do something out there I cant achieve here…that will be good enough for me to go. In such a situation, I will know I am not going back home in a vain attempt to replicate the lifestyle I am used to here. Many thanks for the comment Laja. My mind is certainly open to going back home but I dont want to regret it at all when I make the move….or end up feel like my expectations havent been met by taking the decision to move back home. Ultimately, I think the point I am trying to make is that, whatever reason you decide on to move back home, by God, make sure your motivation is right. Nigeria has a way of never going according to plan and it is that motivation that will keep you going. You are intelligent mad writer. I enjoyed reading this. Especially the part you highlighted (#11) about the “ali must go” riots and how such an event decades ago still affected someone you met…34years later . Every single number in this post highlights something about the complex nature of our beloved country. The genius..is what you have done. Breaking it down in stages / numbers. FF, I am a Nigerian living abroad, and I take some issue with the mention that greed is the reason for choosing to or desiring to return home. I’m not disputing that greed likely is the reason for more than a few. This is, in fact, true. But I tend to disagree that one who does return cannot change anything. It will be hard for sure, and one must be resolute and motivated. But it is possible to make a difference – be it for one person or more; it can ripple-out from there. Once again, thanks for writing. As I read this, it reminded me of your incredible article on Singapore which took me through series of moods and varied emotions as I read it. I don’t really know what I like most about your writing, whether it is your humorous sense, the conviction or the analytics. But please what is the meaning of “Penkelemes?” 🙂 I have a feeling that I will appreciate the article more if I know the meaning of that word.